17/4/12 - Acquisition - Dresden, Gemäldegalerie Alte Meister - After training in Berlin, then spending time in Sweden and France where he frequented Jean-Georges Wille’s studio, the landscapist Jakob Philipp Hackert traveled to Italy in 1768 where he was painter to the King of Naples, Ferdinand IV from 1786 to 1799 before spending his last years finally in Tuscany . 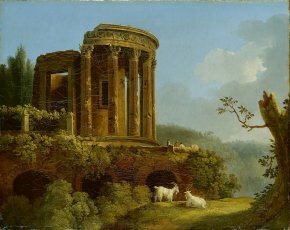 The Dresden museums have just purchased a landscape by this artist representing The Sibyl’s Temple in Tivoli (ill.) from a private collection for the Gemäldegalerie Alte Meister. The walks which Jakob Philipp Hackert took around the outskirts of Rome with his large drawing boards, in the company of his brother Johann Gottlieb, were described by his friend Goethe who published his journal after he died. This view was probably drawn on one of these outings then painted later in his studio. We know that the site was one of the favorite motifs for Italian and foreign artists exploring the Roman countryside from the 17th to the 19th century, as illustrated recently by an exhibition at the Musée Cognacq-Jay. Hackert did not like to paint the figures in his compositions and often entrusted the task to other artists such as Wilhelm Tischbein. Here, except for three small, barely distinguishable human forms, there are only two goats in the foreground to bring some life to the landscape. The enactment of the agricultural reforms in East Germany starting in 1945, which consequently expropriated not only former Nazis but also large landowners, had resulted in the confiscation of this painting. It was then exhibited at the Pillniz palace, outside of Dresden, which houses the museum of decorative arts and was left there on deposit after being restituted to its owners in the 1990’s. Following its acquisition by the national collections, the canvas will now join the gallery of old master paintings (Gemäldgalerie Alte Meister). It establishes a transition with the landscapists which came after Hackert and were influenced by his art, notably Caspar David Friedrich, displayed at the Galerie Neue Meister. On Jakob Philipp Hackert, readers should consult notably Anna Ottani Cavina’s entry in the catalogue for the exhibition, Paysages d’Italie. Les peintres de plein air (1780-1830), Paris, Grand Palais, 2001, p. 66.